Welcome to The Fruitcake Factory! Our Micro School, , in the beautiful village of Meopham in Kent, was set up with our focus on personal attention for our students in our small classes. 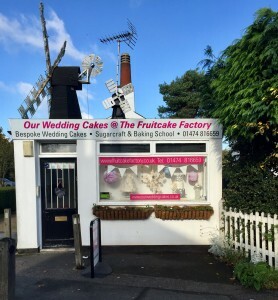 Karen & Tom, our Tutors, have over 25 years experience each in teaching Sugarcraft & Baking and nothing pleases them more than their ability to pass on their knowledge with traditional and Artisan skills. With boundless patience and absolute attention to detail, Karen, our Sugarcraft expert, will teach you how to make realistic looking Sugar Flowers, Animals and Decorations or teach you how to Coat and Decorate your own Celebration Cake. Tom, our Baker, be prepared to roll up your sleeves as he teaches you the traditional Artisan methods to make & Bake all kinds of Cakes, Buns, Biscuits, Pastries and Confectionery. With no equipment to buy, free recipes and expert guidance, we are sure that you will have a very enjoyable time learning with us. To see some of Karen’s cakes, please see the ‘Our Cakes’ part of our website or visit www.ourweddingcakes.co.uk for examples of the Wedding Cakes Karen has recently designed.